The arrival of April heralds a new financial year, but one that doesn’t bring with it the usual inflation-linked increases in tax thresholds and benefit rates. The former are set to rise faster than inflation – providing a tax cut for those earning more than £11,100 – while the latter continue to be frozen in nominal terms despite fast rising inflation. The net result is a giveaway by the Treasury of £1 billion in 2017/18, but one that is highly skewed across the income distribution. The lifting of the personal tax allowance – the point at which income tax becomes payable – to £11,500 and the similarly inflation-busting raising of the higher rate threshold to £45,000 combined are set to cost over £2 billion. Maximum gains of £80 across nearly 30 million basic rate taxpayers and £240 across 4.5 million higher rate ones will provide some relief in a year in which inflation is expected to outpace wage growth for at least some of the period. But benefit cuts worth over £1 billion will simultaneously push back on the incomes of many households. The largest part of this will stem from the continued cash-terms freeze in working-age benefit rates. The four year freeze started in April 2016, but failed to bite last year because inflation hovered around zero. With inflation having since picked-up – driven by rising oil prices and by the post-EU referendum fall in the value of sterling – the government is now expecting to save £2.7 billion more over the lifetime of the policy than it originally thought, with the savings racking up from this year onwards. In the absence of the freeze, benefits would have been set to rise by 1 per cent in early April (in line with the September 2016 rate of inflation which is the default uprating benchmark). That they now won’t rise at all represents an £800 million saving for the government; and an equivalent takeaway from low and middle income households. And the lived experience of this cut will seem greater still, with the OBR predicting that inflation will top 2.5 per cent over the course of 2017-18. Other forecasters expect it to rise to over 3 per cent. This cut will be broadly felt across working-age welfare recipients. But other cuts and changes in eligibility will have much more concentrated effects. For example, the family element of tax credits and Universal Credit (UC) – worth £545 a year to recipient families with children – will be removed for families with a first child born on or after 6 April. This will affect an estimated 270,000 families in 2017. A much larger cut – concentrated on a smaller group of families – is the limiting of support to just two children within the tax credit and Universal Credit systems. Those affected will no longer receive up to an additional £2,780 a year for each additional child beyond two born from the 6 April. The 160,000 families losing out in 2017 are expected to lose an average of £2,000. These changes to family benefits are alongside reductions in entitlements for some Employment and Support Allowance recipients next year. While the benefit changes arriving in 2017 have a relatively small aggregate effect this year, they are a big deal for the families affected and their impact will grow as more families become affected by these policy shifts in subsequent years – or to put it another way as more children are born with significantly reduced support from the state. The scale of the takeaway will also quickly build in the coming years with benefit cuts announced since the general election in 2015 rising to well over £12bn by the end of the parliament. While the net effect of these tax and benefit changes from April will be a £1 billion giveaway this year, there is only limited overlap between the winners and the losers. Indeed, those who gain the most from tax cuts are precisely those who are least affected by benefit cuts. 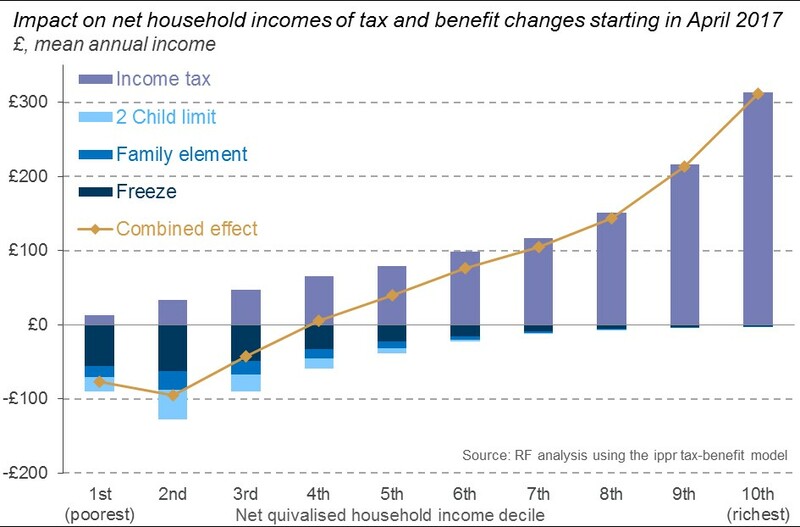 Four-fifths of the gains from the increase in the tax thresholds will go to the richest half of households; whereas two-thirds of the losses from benefit cuts are felt by the poorest third of households. Overall, the bottom third of households will be made worse off by tax and benefit changes next year, as shown in the figure below. Within this group, annual losses will average £70, but some families will be over £2,000 worse off. Richer households unaffected by the benefit changes will be up to £480 better off. There are other changes in support not included in these calculations and chart, but they are likely to have a limited impact in 2017. For example, Phillip Hammond used the Autumn Statement to outline plans to lower the UC taper rate from 65 per cent to 63 per cent from next month. This will slow the pace at which UC awards are reduced as recipients’ incomes rise, and will provide a modest improvement to incomes and progression incentives. But with few working families expected to receive UC in 2017-18, this move represents only a £35 million boost to incomes. And it is offset multiple times over by the previous cuts to work allowances announced by the Chancellor’s predecessor in Summer 2015. Additional support will also arrive in the form of childcare changes, with some parents expected to start receiving tax-free childcare from the end of April. The scheme will cover 20 per cent of up to £10,000 of each child’s costs, but households in receipt of tax credits or UC are ineligible. An additional 15 hours of free childcare for 3 and 4 year olds is set to follow in the Autumn, available to families in which all parents are working and earning more than the equivalent of 16 hours at the wage floor but less than £100,000. Welcome though this change will be for those benefiting, it will again do little to offset the losses from benefit cuts for all of those affected. Further out, the uneven distribution of tax and benefit plans in 2017 is likely to get worse as the parliament proceeds. The Chancellor has reaffirmed his party’s commitment to its manifesto pledge of pushing the personal tax allowance and higher rate threshold to £12,500 and £50,000 respectively by the end of the parliament. Higher projected inflation means that now appears to be a less generous offer than it previously did, but it remains a regressive and expensive giveaway. And on benefits, we know that there are much bigger losses to come. The freeze is set to continue and to bite harder through 2018 and 2019, while increasing numbers of families will be affected by limiting support for children. Significant cuts to in-work support provided through UC will also have a greater impact as the majority of working families move over from the tax credit system to UC by 2020. At that point overall UC generosity for working families will have been cut by over £2 billion, even after accounting for the giveaway associated with the taper reduction. Taken together, even adding in gains from free childcare hours and the development of the National Living Wage, this all means that by 2020 we can expect the poorest half of households to be worse off from combined tax and benefit changes announced this parliament. Coming on top of a potential new wage squeeze in 2017 and sluggish pay growth over the rest of the parliament (average earnings aren’t expected to return to their pre-financial crisis levels until the second half of 2022), the outlook on living standards is bleak. In the absence of any further policy changes, our expectation is that incomes will fall over the course of the parliament by between 1 per cent and 5 per cent a year across the bottom third of the income distribution. Now things can, and should, change between today and 2020 but if this outcome came to pass it would represent the toughest period on record for low and middle income families, and would result in the sharpest uptick in inequality since Margaret Thatcher’s last term in office. Tackling this challenge will not be easy but the government is far from powerless. Policies designed to boost growth and productivity can help, but the government must also reprioritise its tax and benefit plans in order better balance its forthcoming giveaways and takeaways. Any attempt to usher in a new era of prosperity and inclusivity will be undermined without it.